Let's revisit my favorite decade! Dr. Martens are back, baby! These shoes were created in 1945 by Doctor Klaus Maertens for comfortable wear. Apparently almost every teenager had a pair in the late 90s. They’re not the prettiest shoes you have ever seen, but in the 90s, people only cared about comfort. Baggy shirts and jeans are comfortable; throw them on. Now that I mention it, I could really use some Doc Martens. I’m wearing leather shoes at the moment and one of my toes is killing me. 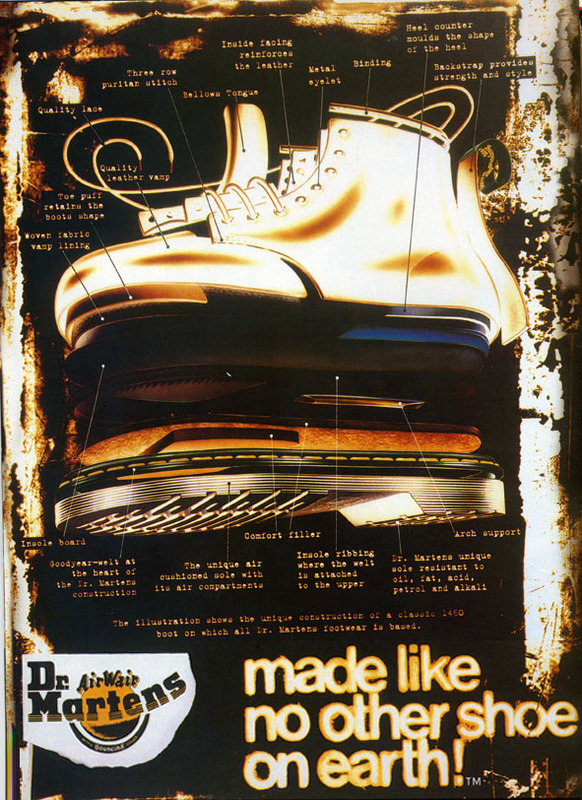 A superb add of classic Dr. Marten shoes 1460 from 1997. Click to enlarge. I see students wear them as school shoes. Yeah. School shoes were a huge hit in the 90s. I find these knee high ones much more edgier. Dr. Martens have released fluoro colours for the new era. I read in some fashion magazine it’s great to wear these with miniskirts. NO thanks. Try wearing them with acid-washed jeans. Vomit. How ’80s would you look, huh? If you haven’t noticed, I don’t like 80s fashion. Especially not the fluoro colours. Vintage black is the way to go. For females; wear them with your Little Black Dress or other winter dresses to give the feminine look some edge. For males; try not to wear it with too much black as you will look gothic. Wear them with patterned pants and plain shirt. If you think you can’t pull it off, jeans are always a good but safe option. Here are some of the latest models/celebrities wearing Doc Martens around. Ross: Joey, nice shoes, man. Ross: [Long Pause] Ehem. What about mine? Does that line sound farmiliar? Well of course it does. It’s the first episode of F.R.I.E.N.D.S. 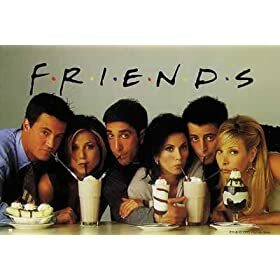 Why was I watching FRIENDS at the age of four you say? I didn’t watch it that young. I think I started watching episodes on television at the age of six or seven, although I didn’t understand what was going on, I still enjoyed it. They looked like a bunch of friends who had fun around each other. I didn’t get the deal with Rachel and Ross. I liked Monica more because I felt like the series was leaving her out of the bigger storylines, plus she was really pretty so I didn’t understand why the show had to focus so much on Ross and Rachel. At that age I didn’t know Monica and Ross were brothers and sisters, so I thought they would make a great couple. I’ve seen all episodes from every season and I love every single one of them. My opinion with Ross and Rachel changed, so I was so glad that they ended up together, and hated it every time they fought. The first episode wasn’t that funny, and I didn’t care because it was a pretty good pilot. Ross was suffering heart ache with his wife spending time with another woman (a lot of tv characters like the idea of seeing their girlfriend with another girl) and must buy new furniture for his new apartment since Karol kept everything. Rachel just ran away from her wedding to Barry, which was a big opener. Chandler Bing was the funny sarcastic guy right from the start and Phoebe was without a doubt, one weird chick. The best thing from that episode was when Phoebe sang in the subway. I kept singing that song for a whole week and I have never gotten sick of it. People thought I was weird. That was fun. I thought Monica’s and Joey’s character hadn’t been developed very well in the first couple of episodes. In Australia, FRIENDS created a war between the two biggest channels. Channel seven and channel nine were playing the show at the same time, does anybody remember that? Did you know that Matt Le Blanc dislocated his shoulder whilst leaping onto a chair on the FRIENDS set? Well . . . I didn’t. The first episode, TOW Monica Gets a Roommates, was a really long one. It either ran for twenty nine minutes or thirty nine minutes, which meant there weren’t any room for chemercials unless they allowed it for one hour. It’s playing reruns here and skipped many of the scenes of the episode! I was so happy that they were going to play it in a channel where many of it’s audience were teenagers. It meant FRIENDS may get a new generation of fans. I think they skipped my favorite scene. That upset me. Not only was FRIENDS a hit tv show, it made fashion history. Specifically Rachels hairdo. I wonder if they still know what you mean.